2 chocolate recipes in a row?! I feel like it’s a big milestone because I don’t actually like chocolate-flavoured foods. Big schock. But who can own a recipe blog without a chocolate recipe on it? Don’t worry, though; I didn’t torture myself when I was creating this recipe or my chickpea chocolate mousse. I created both of the recipes to be something you can enjoy even if you’re like me and don’t like neither chocolate cake nor ice cream (a.k.a. weird in other people’s eyes). For once I’m going to give you a life update. I don’t want my blog to only be about food, but I guess food is just a very.. big part of my life. Anyway, I’ve adopted 2 guinea pigs! They’re 2 adorable girls, and they’re coming home with me sometime after the 29th of August. I can’t wait to meet them, and I can’t wait for you to meet them as well! I’ll introduce them to you in another blog post once they’ve settled in, and I’ll write every little detail about them, so stay tuned! Now, let’s get back to the recipe. Did you forget to make your chia seed pudding the day before? Oh, no! 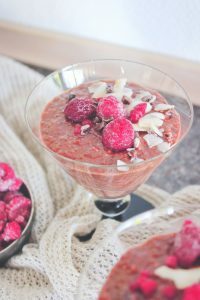 Luckily for you, the chia seed pudding I’m sharing with you today can be made in just 20 minutes. Because of the mashed raspberries and cocoa powder, it thickens up very quickly. 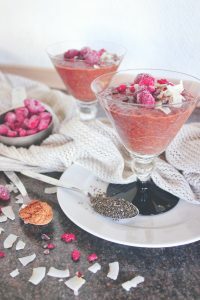 But of course it still works like any other chia seed pudding recipe, so you can still prepare it the night before and enjoy it the next morning. 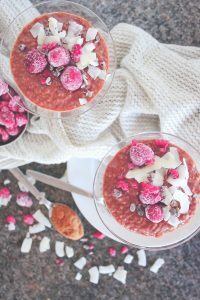 Since I’m not the biggest chocolate fan, I only use one tablespoon of unsweetened cocoa powder when I prepare the chia pudding, but you can add as much as you’d like, just make sure to compensate with another teaspoon or two of agave syrup as unsweetened cocoa powder can leave an unpleasant bitter taste. Or maybe I’m just sensitive. Let me know if you like this recipe! You can leave me a comment below or tag me on Instagram (@spirendeveganer). I’d love to read your opinions and see you recreations! Warm the raspberries in a small pot over low heat and mash with a fork until no lumps remain. Stir the chia seeds, unsweetened cocoa powder, maca powder, and sea salt together in a sealable jar. Add a small amount of the non-dairy milk to the jar and stir until smooth. Add the mashed raspberries, rest of the non-dairy milk, and agave syrup to the jar and stir until combined. Adjust the flavour by adding more unsweetened cocoa powder, agave syrup, and sea salt to taste. Seal the jar and refrigerate the chia seed pudding for at least 15 minutes – after 15 minutes, the chia seed pudding should be thick and ready to serve already. Even if you’re not eating it now, stir the chia seed pudding to ensure the consistency is even. 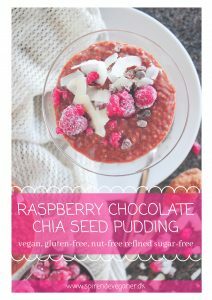 The chia seed pudding is best when eaten within 2 days of its preparation. 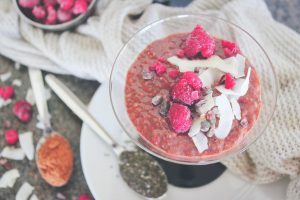 Serve the chia seed pudding with raspberries, coconut flakes, and cacao nibs and feast!